Google has been experimenting with displaying additional information for discussion boards in the search results and now the experiments are live. Below the title, Google lists automatically generated data about forum threads: the number of posts, the number of authors and the date of the last post. The additional information helps you decide if the search result is likely to be useful. If a thread has a single post or the last post is very old, you could ignore the result. This new feature shows that Google is able to automatically classify web pages and to extract relevant information. Once Google starts to show data for other kinds of web pages, we can expect to see an option to restrict the search results to a certain category (forums, reviews, blogs, news articles). I really like this new addition to Google Search.. 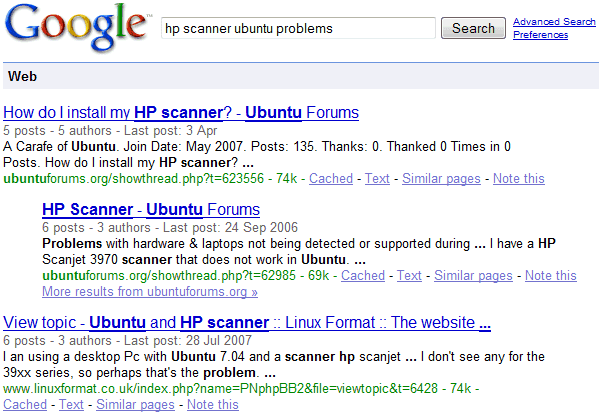 It strikes as being a clever feature that will get frequent use and that will further improve Google's search results..